So you’re just hanging around at home on Saturday evening when you realize your music collection is becoming archaic. Or you’re sitting in the park when you open your phone and realize there’s no matching tune to listen to? Lucky for you, the Android ecosystem has more music apps than you can stomach. If you’re ready to spend a few bucks on a good app to listen to music on the go, you can get the likes of Spotify, SoundCloud, or TuneIn Radio. But if you have no bucks to spare, or don’t fancy the idea of having to use up your mobile data any time you have to listen to music, then what you need is a free music apps for Android. After trying out a few apps, below are the best free music Android apps I could get. Note: since free music apps don’t charge you any money to use them, they usually run ads. If you have to download the apps below, don’t mind seeing a few ads here and there. This is my number 1 app for downloading free music to my Android phone. There’s no limit to the variety they have here, from music to mixtapes and more. You can browse music from all categories including Rap, EDM, Reggae, R&B, and download it to your handset so you can listen when offline later. The app is pretty easy to use, and you’ll be tapping the download icon to get your favorite and hottest tracks before you know it. From the app’s home screen, you can access Trending music, Top Songs, Top Albums, as well as Recently Added. You can follow your favorite producers, artists and tastemakers. It’s all incredible! 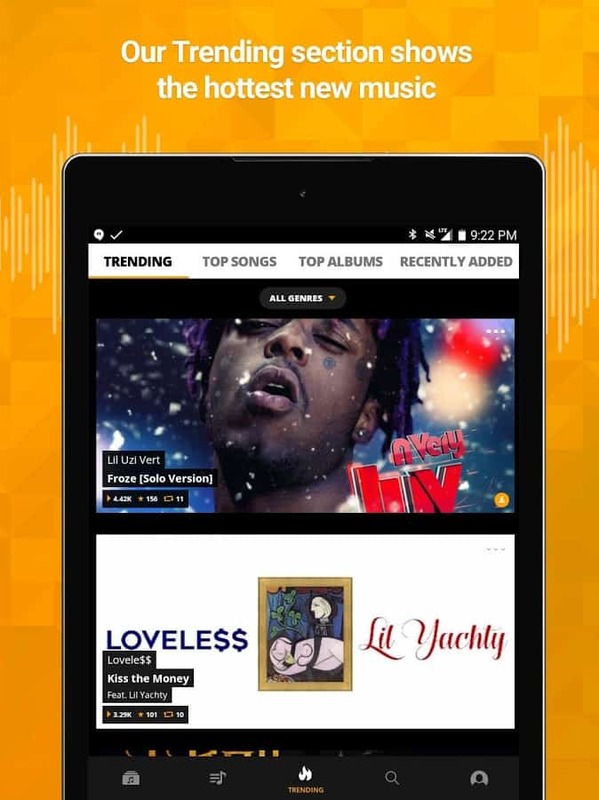 It’s no wonder Audiomack is used on more than 5 million devices, and scores a top-tier average rating of 4.5 from over 100,000 users on the Play Store. And if at some point in the future you feel like the ads are too depressing (which they are not), you can get rid of them by paying a one off $1.99. This is an excellent app to download your favorite songs within a matter of seconds. 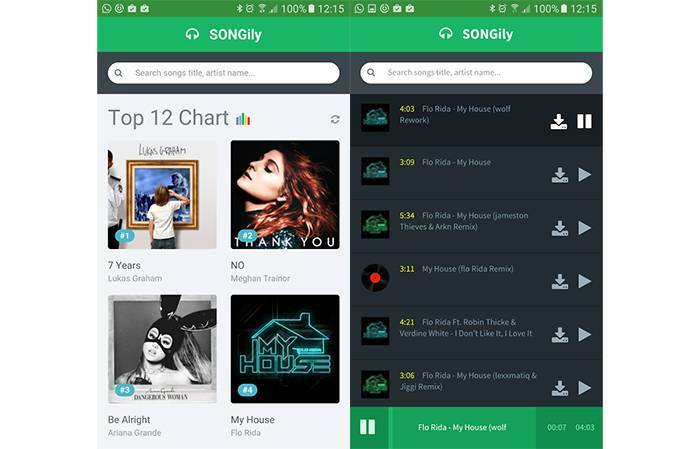 Songily features an enticing green-themed interface, and is absolutely easy to use. You can select the latest track from the main screen once the app loads, or use their prominent search field to find what you’re looking for. Anything that you download using this free music app goes to your download folder. You can open any song you download and play it with any other app at any time in the future, whether or not you’re online. Songily is definitely one of the best free music apps for Android. You’re going to see a few ads here and it’s nothing obstructive. Songily is currently installed on more than 1 million Android devices, and attracts a notably positive average rating (4.2 as of now) users. This is a simple and fast mp3 music downloader, and one of the best free music apps for Android. The app allows you to stream or download any song for non-commercial use. They claim to have an inventory of more than 1 million mp3 tracks from artists all over the world. You can access whatever song you’re looking for by simply searching it from their screen-top search bar. Download Mp3 Music is installed on more than 10 million devices at this time. This free music Android app has an average rating of 3.3 on the Play Store. That’s probably because some users have complained about the app arbitrarily failing, which I didn’t experience myself. If you’re looking to download your favorite tracks in Mp3 format for personal users, it’s almost a sure bet that Download Mp3 Music will not disappoint.